The hosts were friendly n loving n sweet. 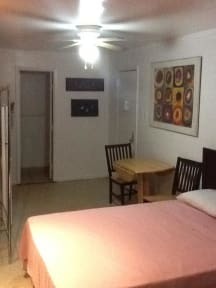 Close to subway n rooms were clean with workin tv n fridge. The hostel was fabulous cus this is an old building with rich architecture. listed as hostel, but not a place for mingling or meeting travelers . strictly a place for private stay . no amenities as provided in a hostel . no table nor chair . clean looking but room floor was very sticky . 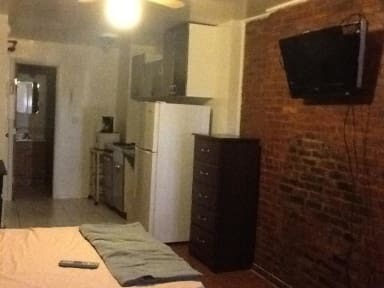 one plus : low rate for nyc and conveniently located in cheaper area, close to public transportation . friendly accommodating staff . The room was the cheapest available, so I wasn't expecting luxury - but the state of the room was not even close to hygienic. I could forgive the stained sheets, the food stains on the floor and walls, the dark hair of differing lengths all over the room and the general stickiness on all surfaces, but the bugs were a bit much. We killed anywhere from 2-8 mini cockroaches each day. Do message ahead to confirm bookings, owner seems nice but very disorganized. Great location with easy subway access. Location was the only thing I liked about this place. On photos looks very nice,but in reality is very dirty. They did not even clean it before I arrived and I had to clean the dust,so I can put my stuff. Bathroom and kitchen were also very dirty and there were bugs running around,that I really hate seing. Bed was uncomfortable and blankets were old and tiny, not even decent. I won't stay at this place anymore. I booked a room at the hostel a month in advance.When I arrived I learnt that they are overbooked and I do not have a room. Hostel staff made no effort to find a solution for me. Attempted to call Hostelworld 4-5 times, nobody picked up. Sent 4 (four) emails to the website, marked 'urgent' - no reply until next day saying will investigate -no news since (5 days). Vacation ruined, $ loss: flew back home. Worst traveling experience I ever had. Excecrable customer service.